Pistachios are naturally cholesterol-free and they are nutrient-dense, so they're ideal for snacking. A small portion of pistachio nuts (about 1 ounce) can help with hunger and taking them out of their shells helps slow you down, so you can relax and enjoy each tasty nut. And, pistachios have a heart-healthy fatty acid profile as well. 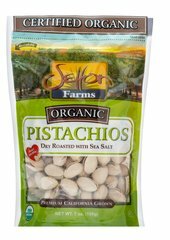 1◊ Perfect on their own, these in-the-shell, salted, roasted pistachios are a sweet and salty, nutty treat. 1. http://www.ncbi.nlm.nih.gov/pubmed/22458696 ◊Scientific evidence suggests but does not prove that eating 1.5 ounces per day of most nuts as part of a diet low in saturated fat and cholesterol may reduce the risk of heart disease. See nutrition information for fat content.